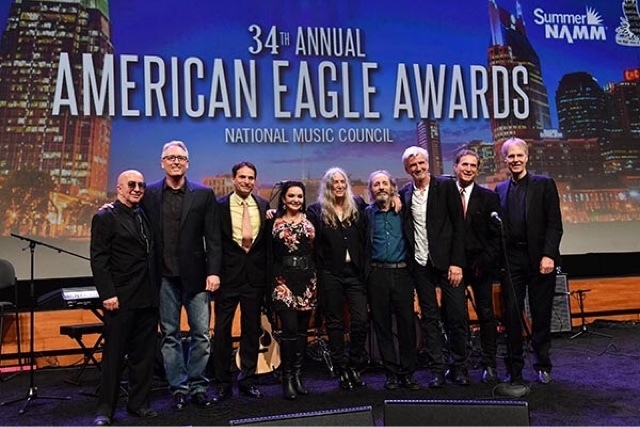 NASHVILLE, Tenn.– The National Music Council presented its prestigious American Eagle Award to industry icons Crystal Gayle, Harry Shearer, and Patti Smith on July 13 at The Summer NAMM Show in Nashville, TN. National Music Council Director, David Sanders, hosted the awards ceremony along with presenters Paul Shaffer, Richard Leigh and John Ingrassia. The honorees and presenters collaborated for an unforgettable finale performance of the song “People Have The Power,” written by Patti Smith and her late husband Fred “Sonic” Smith. The awards are presented with support from The NAMM Foundation, a non-profit which works to advance active participation in music making across the lifespan through scientific research, philanthropic giving and public service programs. To learn how to support The National Music Council and their music education advocacy efforts, visit www.musiccouncil.org. For The Summer NAMM Show schedule of events for the remainder of the weekend, visit www.namm.org/summer/2017.